In 2008, Janell was awarded a Farmer/Rancher grant from the Sustainable Agriculture Research and Education (SARE) program of the USDA. 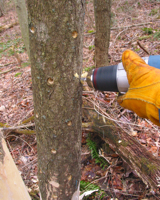 This grant funds research to further develop and assess the economic potential for an organic method to simultaneously control a woody invasive tree species while producing edible mushrooms for sale in local markets. 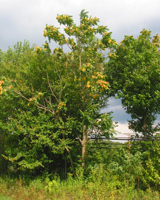 Many farms, woodlands, and roadsides throughout Ohio are plagued with aggressive populations of a southeast Asian tree, Ailanthus altissima, also known as "Tree of Heaven". Ailanthus is invasive and fast-growing, rapidly colonizing disturbed areas -- such as areas that have recently been logged or cleared of brush -- and crowding out desirable native species like oaks and walnuts, which favor similar types of habitat. 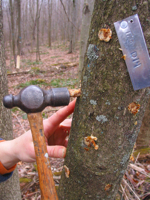 Most landowners are advised to control Ailanthus by using a chain-saw to girdle or fell the trees and then inject a powerful herbicide into cuts or holes. 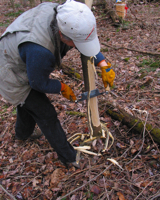 This is time- and labor-intensive, is dangerous for people untrained in safe chainsaw techniques, introduces herbicides into the farm or forest enviroment, and requires investment in expensive pieces of equipment. Janell has developed an alternative, minimum-impact control technique that is safer, quicker, cheaper, and introduces no foreign chemicals into the local environment. The new method also has the advantage of slowly killing the Ailanthus trees, allowing natural patterns of woodland succession to occur as the trees die and cease to provide shade cover. With the support of the SARE grant, Janell has sought out local scientists and developed a systematic evaluation of her control technique. She has also attended a workshop by Paul Stamets, arguably the world's foremost expert on mycoculture -- on the cultivation of fungi. With techniques learned at this workshop, she has produced plug spawn from three edible mushrooms (Laetiporus sulphureus aka chicken-of-the-woods, and two strains of Pleurotus ostreatus, i.e., oyster mushrooms) and introduced them into a subset of the Ailanthus trees she has treated. dying Ailanthus trees may serve as a productive substrate for growing culinary mushrooms for sale in local markets. Her results and final report are now available, both here (be patient, large PDF) and at the official NCR-SARE website. 2009 OEFFA Conference poster (PDF, Feb. 2009). Note: large file to allow good viewing online - it will take a few minutes to load. The activities funded by this grant, and other sustainable forestry activities practiced at Blue Owl Hollow, was showcased on Sunday, October 25th 2009 as a part of the 2009 OEFFA Farm Tour series (we're on page 9). The tour was co-sponsored by OEFFA, ODNR Division of Forestry, and Licking Co. SWCD. Ailanthus altissima in full bloom. Organic, non-herbicide method for controlling Ailanthus. Drilling holes for mushroom inoculation. Inoculating the dying tree with mushroom plug spawn.